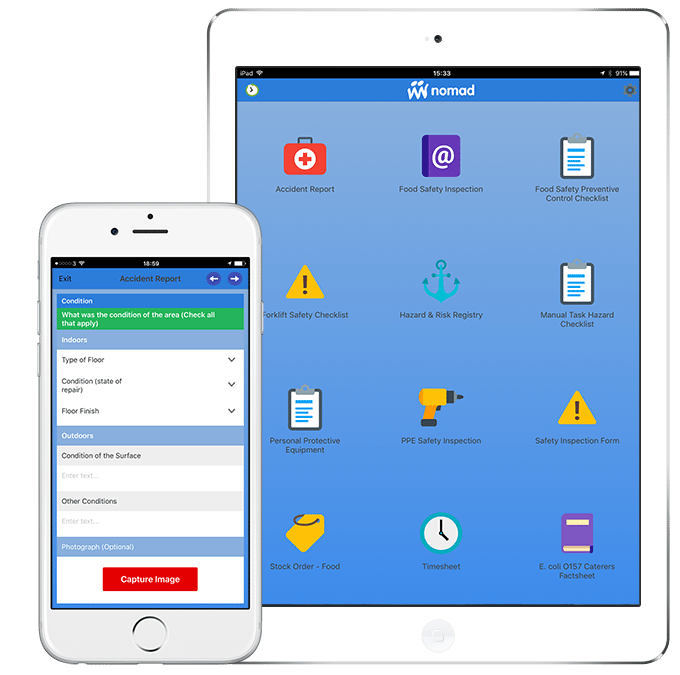 After many years implementing and advising on mobile working Digital Nomads now offer bespoke mobile working data capture apps for businesses and the public sector. Mobile enable your processes to improve productivity and efficiency. Surveys, inspections, checklists, audits and reports are fast and easy with Nomad Mobile Solutions on your phone or tablet. Easily capture GPS, photos, video, audio, barcodes and signatures. Offline capable, intelligent technology securely caches data on the mobile device and synchronises when connected. Generate detailed PDF report pro forma and automatically send via email. Integrate with Google, Dropbox, OneDrive and other popular file storage services and benefit from our development API, for more powerful integrations with other systems. Use your smartphone or tablet to cut costs, save time and replace paper processes. The Nomad App is managed via a cloud based web platform where Digital Nomads set up your organisation and users and build your mobile forms (data capture screens). The Nomad App is available to download from the Apple App Store (Android coming shortly). When you log into the app, mobile forms unique to your organisation and users will be ready for use. We configure your solutions, building bespoke reports to merge with data captured in the field and to generate pro forma PDF’s that can be automatically emailed to yourself and/or your clients directly from location, without having to return to the office to type up a report from paper notes. What’s more our solutions integrate with a range of services and include a full API for integration with back office systems. For more information visit our dedicated mobile working solutions website here. Or call us to find out more and arrange a FREE trial.